While chief minister Mamata Banerjee is leading the protests in Delhi, party leader in state and every district. Today in Kalimpong Darjeeling District Hill TMC took out a rally with party leaders supporters in Town area. 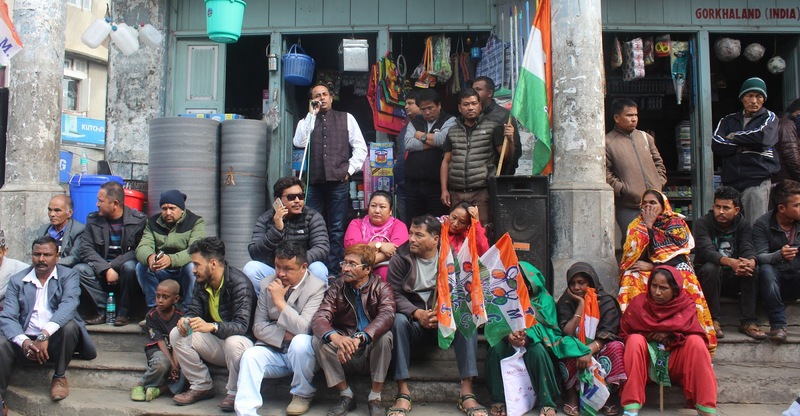 The tally started from Thana Dara which encircled the town are with different Slogans.Apart from Binny Sharma the other leaders present were leaders from Kalimpong area. The Rally turn into a street corner meet where Binny Sharma said that economic crisis which the country is facing have not trouble the industrialist, big business tycoons but general mass who like begger is standing in long queue to take out their own cash.He said we are not supporter of Black Money but against the system which the country is going on. He added that some business man in hills is helping exchanging this black money. We know their names and when times come we will make it public. He added that time will come when BJP itself will throw out Modi and GJM Bimal Gurung. He also congratulated the people of Kalimpong which in few month time will turn into a District. He said The CM promised District first later declared and now fulfill it. She is always with the people of Hills. TMC is ready to contest the upcoming elections in Hills added Sharma. 0 Respones to "Hill tmc leaders rally against demonetization "